Green safety signs – Signs that are green are information signs or safe condition signs. These signs point out information such as emergency exits and the location of first aid. Red safety signs – Sign’s that are Red on white are signs that mean that this is prohibited (Forbids and action), The most common sign for this is the no smoking sign. White on Red Safety Signs – These signs are for Firefighting equipment, they will Identification and show the location. Blue safety signs – If you see a Blue safety sign this means specific behaviour or action e.g. wearing personal protective equipment is mandatory. Yellow safety signs – Yellow warning safety signs there is show you warnings or hazards, these signs indicate to be careful, take precautions or examine. Some common signs are a risk of electrocution signs. 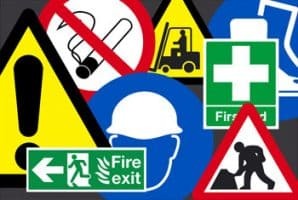 We hope you found these CSCS revision notes on health and safety signs helpful and if you did could you please share using the buttons below to help out others find these more easily. What a brilliant website! i’m currently revising for my CSCS test and this is proving extremely helpful, THANKS! appreciate your kindness making this site! Well done to you!